Like many businesses nowadays, insurance companies are using drones in their day-to-day operations. Insurers began experimenting with unmanned aerial vehicles (UAVs) about five years ago and found them useful for adjusting property claims. Since 2016, when the FAA loosened the regulations on drones used commercially, more insurers have begun using them. Soon drones may be as ubiquitous at insurance companies as computers and cell phones. Drones have certain features that make them especially useful to insurers. For one thing, they are small, easy to maneuver, and don't require an airport runway for launching. Thus, they are much cheaper to use than manned aircraft. Secondly, drones don't require an onboard pilot, so they can travel to places that are unsafe for humans. Thirdly, drones move faster than humans. They can travel more quickly over a large geographic area than human "boots on the ground." Roof Damage Inspections. One of the most common uses for drones by insurers is rooftop inspections. Roofs are notoriously difficult and hazardous to inspect. An inspection is particularly dangerous if a roof is steep or has suffered fire damage. Rather than climb onto the roof to take pictures, an adjuster can use a drone equipped with a camera. Cameras used on drones can capture very detailed images. Moreover, a drone can photograph the entire roof, including parts of the structure that aren't accessible to a human. Other Damage Inspections. Drones are useful for inspecting damage to large structures, such as warehouses. Boiler Inspections. States laws require periodic inspections of boilers and pressure vessels. Some insurers that write equipment breakdown insurance will conduct these inspections for policyholders and other businesses. Commercial boilers can be several stories high. They are difficult to inspect because of their size and dark interior. Drones make the inspection process easier, faster, and safer. They eliminate the need for both scaffolding and humans inside the boiler. Post Disaster Claims Inspections. Drones are valuable for inspecting areas affected by a major disaster, such as a flood or earthquake. Access to a disaster area may be restricted by civil authorities for several days. Even if access isn't restricted, the area may be too dangerous for adjusters to enter. Adjusters can use camera-equipped drones to capture still photos or videos of damaged property. These photos may be used to process claims. Insurance Inspections. One use for drones is to conduct property insurance inspections. Drones are particularly useful if the insured property is extensive or difficult to reach. For example, a crop insurer might use a drone to inspect a farmer's crops. Certain issues may be easier to spot from the air than from the ground. A drone's camera can be equipped with special lenses to detect problems that aren't visible to the human eye. Fraud Monitoring. Drones may also be used to deter insurance fraud. When a hurricane or other event occurs, some policyholders file claims for damage that existed before the event took place. 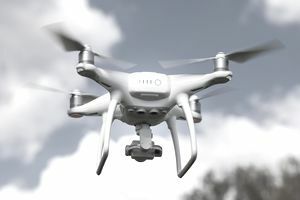 Insurers can disprove some claims by comparing drone camera images taken before the event with those taken after it has occurred. Integration With Other Technology. The images and other data insurers collect with drones are especially valuable when combined with other technologies, such as artificial intelligence (AI). Insurers are using AI to analyze the data, assess the damage, and calculate repair costs. Drones offer insurers a number of potential benefits. One is a reduction in the cost of workers compensation claims. By putting drones, rather than people, in hazardous situations, insurers can prevent some on-the-job injuries. Drones can also lower the cost of roof inspections. When roofs are steep, insurers must provide harnesses and other safety equipment to adjusters. Alternatively, an insurer might hire a contractor to perform the inspection. Insurers can eliminate these costs by using a drone. Drones can also help insurers save money after a disaster. If a drone is used to capture images, fewer adjusters will be needed to inspect damage at the disaster site. The insurer may reap substantial savings on travel and lodging costs. Moreover, more adjusters can remain in the office to review the loss data and process claims. Drones enable insurers to save time and to focus their resources where they are most needed. For example, suppose a massive flood occurs, causing destruction that extends across many square miles. Insurers can use drones to survey the area and get a birds'-eye view of the damage. They can plan their adjusting activities based on the data they collect. They can prioritize their response, sending adjusters via boats to policyholders that need help the most. Another potential advantage of drones is greater customer satisfaction. Drones can take more photos in less time than a human. By using drones to capture loss data, insurers can process claims more quickly. Policyholders express more satisfaction with their insurers when claims are paid promptly. Drones have a few disadvantages. These generally fall into three categories: FAA rules, the costs of setting up a drone program, and the risk of third-party lawsuits. Like all drone users, insurers must comply with FAA regulations. The current rules allow individuals and companies to use drones for work or business if the aircraft weighs less than 55 pounds. A drone user may equip the aircraft with a camera or other device but the combined weight cannot exceed the 55-pound limit. FAA rules allow drones to be flown during daylight hours only. Drones can fly no higher than 400 feet off the ground and no faster than 100 miles per hour. The aircraft must remain in the visual line of sight of the remote operator. The person flying the plane must have a remote pilot certificate with a small UAS rating. If the drone operator doesn't have such a certificate, he or she must operate under the supervision of someone who does. Insurers will incur costs to establish a drone program. They'll need to obtain the drones and create internal rules governing their use. Insurers will also sustain some costs complying with FAA regulations. They'll have to register their drones, train their adjusters (or other employees who will fly drones), and obtain FAA certifications for all drone pilots. Drones present a risk of third-party lawsuits against insurers. An equipment malfunction or an operator error could cause the drone to hit someone or something. The injured party could sue the insurer for bodily injury or property damage. Insurers also face a risk of suits alleging invasion of privacy. Such allegations could be difficult for claimants to prove if the insurer simply flew a drone over their property. However, insurers use drones to collect data. If they fail to properly secure that data, and the information is stolen or misused, insurers could be subject to lawsuits. Should Prudential Insurance Use Alliance Accounts?